Our tri-annual communication magazine highlighting the work our staff and volunteers do as well as Bureau news and statistics. Click here to read more and see what the MAPCAB have been up to. 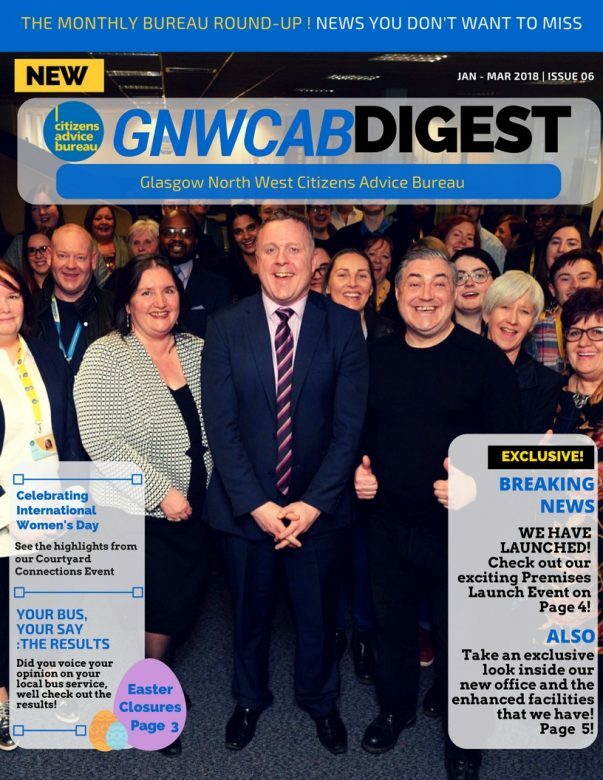 Spring has sprung and so has our new issue of our GNWCAB Digest. Fully packed with cracking events, achievements and news that our team has been involved in over the last three months - including a couple of little Easter Eggs to celebrate the long Easter weekend. Happy Easter from the GNWCAB and enjoy this quarters digest! 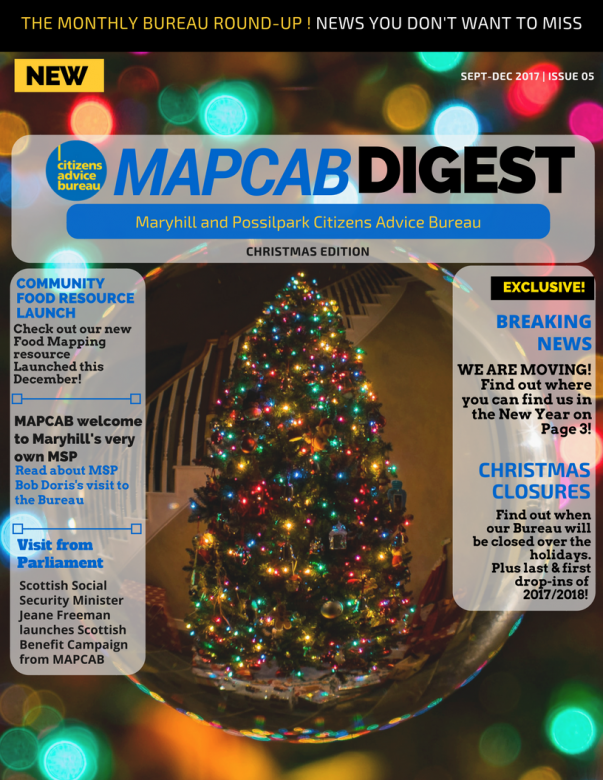 It's beginning to look a lot like... the Christmas Issue of our MAPCAB Digest! Find out some exciting news about our big premises move in the New Year and our many parliamentary visitors to the Bureau. Also, get our staff and volunteer achievements as well as a run down of our Christmas Holiday Closures to mark down in your diary. 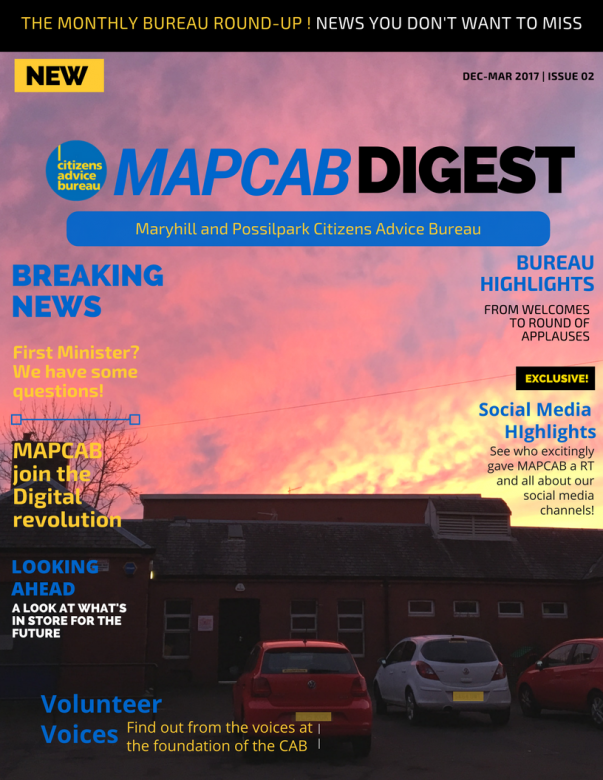 Hope you enjoy our latest issue and we all here at MAPCAB wish you all a very Merry Christmas and best wishes for a Happy New Year! 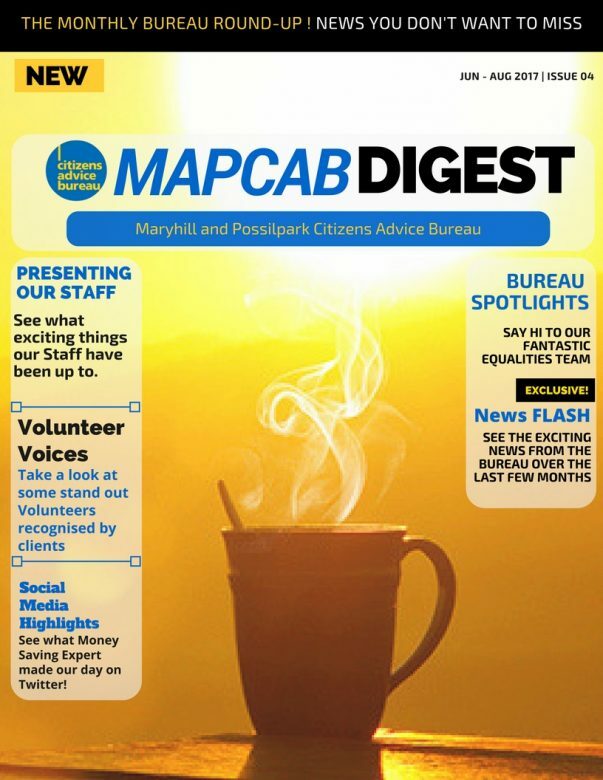 4th Issue of our MAPCAB Digest has ARRIVED! Our issue this month is full of fantastic achievements from both our Staff & Volunteers and great Client appreciation of our wonderful Volunteers. Plus, see what exciting news our Bureau have stocked up over the last few months as well as what popular 'Money Expert' made our day on twitter. 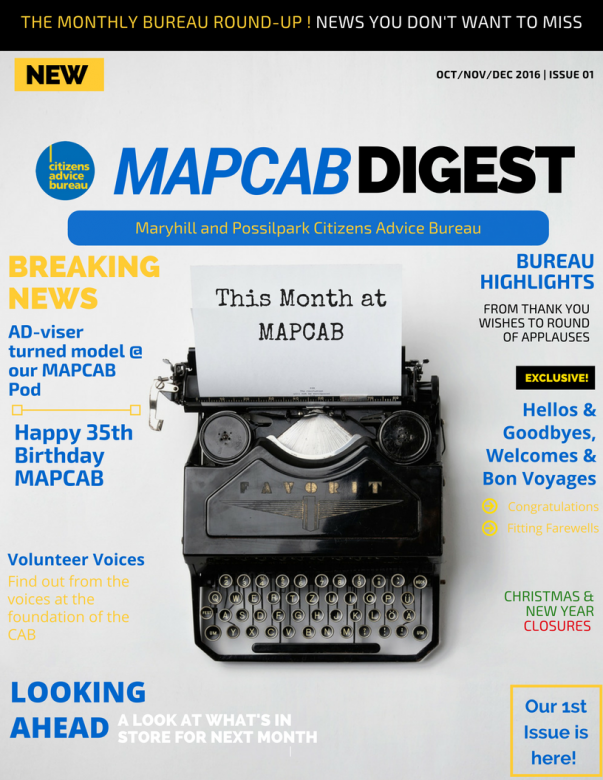 3rd Issue of our MAPCAB Digest is HERE! We have a jam packed issue for you full of exciting new projects for the Bureau as well as just a handful of the work our staff & volunteers do on a daily basis. Also, read about our volunteer success story and our staff team building day! Enjoy this issue and thank you! 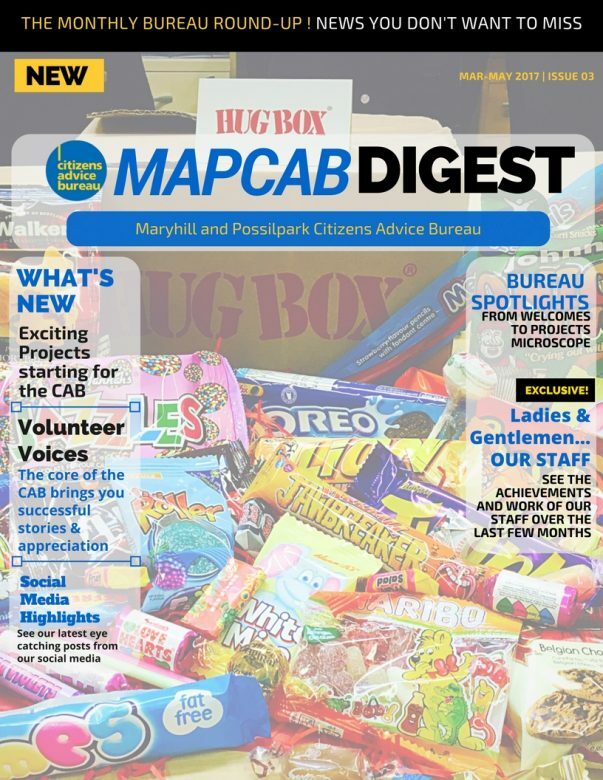 Our 2nd MAPCAB Digest issue is here and it is packed with exciting news from the Bureau as well as positive stories from our staff and volunteers about the crucial and worthwhile work the MAPCAB Team do daily. Also get an insight into the life of a volunteer and their journey as part of the Bureau. Plus, find out when our Bureau is closed over Easter. Enjoy! OUR NEW COMMS - We have had a busy few months at MAPCAB, so why not click here to find out about all the exciting news and achievements the MAPCAB Team have been involved in - from Hello's and Goodbyes to Heartfelt Thanks from clients, here is a little bit of what goes on here at our Bureau. Plus find out about our closures over the Festive period!